Several of the papers lead on the latest round of Brexit negotiations. The Daily Telegraph says Britain's relationship with Brussels appears close to breaking point. 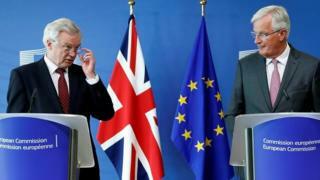 It quotes government sources accusing the EU chief negotiator, Michel Barnier, of being "ill-judged" and "ill-considered" in his approach to the talks. The British side are reported to be scornful of the idea that the UK should pay to leave the EU and then, during a transitional period after Brexit, hand over money for access to the single market. "We are not going to pay twice," one source tells the Telegraph. The Financial Times predicts Theresa May, who is hungry for a new trade agreement with Japan, is set to be disappointed during her visit to Tokyo this week. Officials in Japan tell the FT their priority is completing a free trade deal with the EU. But the Sun reports that the Japanese car giant Nissan is to increase production by 20% at its Sunderland plant. The paper says the firm is also planning to double the British sourcing of parts to offset any tariffs as a result of Brexit. In its lead, the Guardian reports that phone calls about mental health to Britain's biggest police force have hit a record - averaging about 13 an hour last year. It says the number being made to the Metropolitan Police has gone up by nearly a third since 2011. Inspector Michael Brown, the mental health co-ordinator for the College of Policing, blames a cut in funding for NHS services, saying most people making these calls don't need the police, they need a mental health professional. The Times follows up its lead from Monday - criticising an east London council for placing a five-year-old white Christian girl in the foster care of a devout Muslim family who don't speak English and couldn't meet her needs. In an editorial, it says Tower Hamlets council has struggled to recruit white families as foster carers, but points out the girl could have been found a home outside the area. The same story also makes the front page of the Daily Mail. It says MPs have called on the government to examine what happened. Tower Hamlets tells the paper it can't comment on individual cases but it gives absolute consideration to a child's cultural identity. Image caption Part of a stretch of coastline in East Sussex which was evacuated because of a chemical 'haze'. Many of the papers speculate on what caused the chemical haze that made people ill on the East Sussex coast. Both the Daily Mail and the Daily Mirror hear a theory from a leading oceanographer that the chemical cloud could have been caused by a toxic algae bloom in the sea. Other theories in the Daily Mirror include traffic pollution, a chemical spillage or a ship unlawfully cleaning its tank. The Daily Mirror leads with a study which says that statins could reduce the risk of breast cancer by 45%. According to the paper, researchers examined the cases of 1.2 million women admitted to hospital across the country to find out why those with high cholesterol were less likely to develop breast cancer. They concluded the likely explanation was they were taking statins. The paper says clinical trials will now follow to decide whether all women should be given the drug routinely. The Daily Express also focuses on a health story with a warning for arthritis sufferers who take ibuprofen for pain relief. Research suggests they are at greater risk of high blood pressure, heart disease and strokes, the paper reports.